The 2018 iHeartRadio Music Awards was certainly a night to remember. As the biggest pop stars gathered under one roof at the Forum in Los Angeles, the event was fun-filled, inspiring, and all about the music. With co-hosts Hailey Baldwin and DJ Khaled keeping the energy going, Cardi B brought down the house with a medley of her hits, Ed Sheeran slowed things down with a special acoustic performance of "Perfect," and Camila Cabello channeled her inner Madonna for a "Material Girl"-inspired rendition of "Havana." 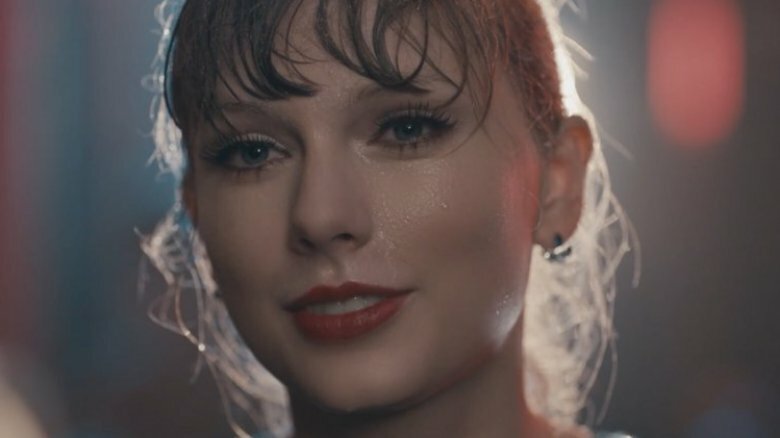 Meanwhile, Taylor Swift dropped the world premiere of her music video for "Delicate." However, similarly to other awards shows this season, the tone of the evening took a politically-charged turn as a number of artists addressed gun violence. Additionally, Chance the Rapper and Cabello delivered inspiring speeches as they respectively picked up the Innovator Award and the first-ever Fangirls Award for their contributions to music and social activism. But that's just what we all saw on camera. What about the entertaining action behind the scenes? Here's what you didn't see on TV at the iHeartRadio Music Awards! Hosting a live awards show may be a whole different ballgame from hosting TBS' Drop the Mic, but Baldwin wasn't exactly feeling the pressure prior to taking on the iHeartRadio Music Awards. "I'm nervous about how calm I am. I've been watching past iHearts and trying to get spiffy with the prompter reading," the model told People ahead of the show, adding that she spoke with her music artist friends to help prepare for the gig. "It's always kind of been the same thing — try to take it easy and don't overdue it," she said. "I think people gravitate more towards someone being genuine. They can call when you're forcing it." 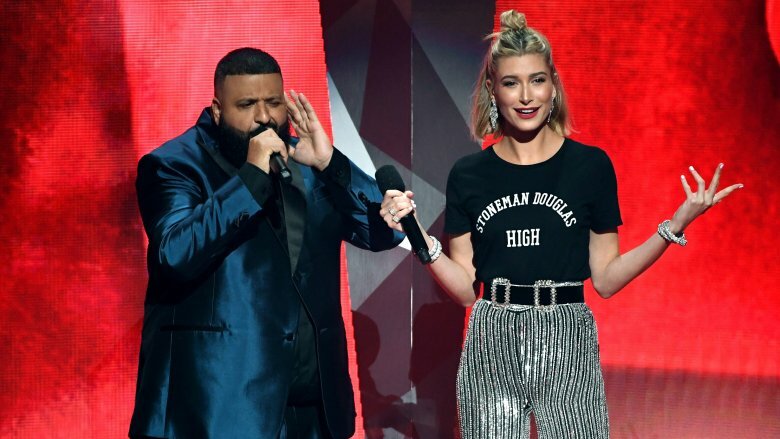 Although Baldwin had only met her co-host DJ Khaled once before — and admitted during the event's red carpet livestream that they had rehearsed together for the first time just hours before the show — the television personality felt good about their chemistry. "He is so good at picking up a microphone and being able to speak and say so many things that make people laugh that are really inspiring," she told the magazine. "It's a good dynamic." Camila Cabello is all of us. 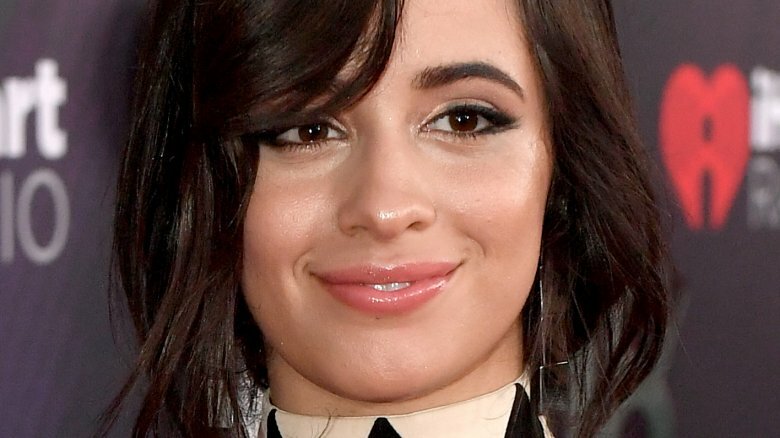 The "Never Be the Same" singer may have been honored with the L'Oréal Paris' Fangirls Award, but she just couldn't help but fangirl over her friend Taylor Swift during a red carpet interview. As Nicki Swift previously reported, in early March 2018, Cabello and Charli XCX were announced as the opening acts for the "…Ready For It?" hitmaker's Reputation tour. "For me, it's a dream come true. When I first met her [at the MTV VMAs] four years ago, I was like, 'I really love you," Cabello gushed to Entertainment Tonight. "I was like, 'Man, I really look up to you. You really inspire me.' She was one of the people that made me wanna start songwriting, so it's really amazing." She added, "I'm, like, really looking forward to the tour hangs, you know? It's going to be like a big slumber party." Ed Sheeran's stripped-down street performance of "Perfect" was a definite highlight of the night. The British singer-songwriter performed the ballad surrounded by a choir of fans, but he somehow had to keep the whole production a secret. 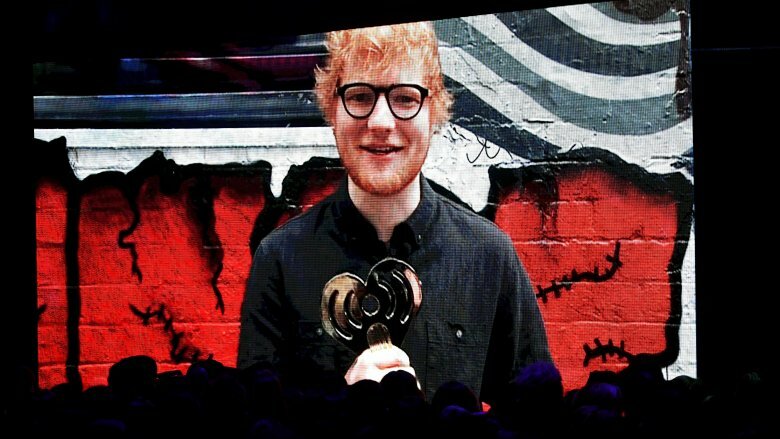 Just ahead of his sold-out stadium concert in Melbourne, Australia in support of his record-breaking album Divide, Sheeran's fans received an exclusive email detailing the surprise performance, which took place in the city's iconic Hosier Lane. About a thousand fans, who were advised to abide by security's strict no food, no drink, no phones, no photos rules, gathered in the laneway hours before the gig, which reportedly caused a chaotic scene. According to the Herald Sun, Sheeran, who took home the song of the year trophy for "Shape of You," only performed the one song for the event's live broadcast. "I'm 'gonna go back to bed," he told the crowd, much to its chagrin (via Broadsheet). "I don't want to be that guy but I do have to save my voice … and if you're coming tonight I promise it will be an A-plus performance." Having won a total of four awards, including male artist of the year, Sheeran later took to Instagram to say, "Thank you @iheartradio x." Halsey and her rapper boyfriend, G-Eazy, were not shy about the PDA. Early on in the night, iHeartRadio's Instagram account shared a sweet photo of the two kissing while posing together on the red carpet, captioned with, "MY HEART!!!!" A video later surfaced on iHeartRadio's Twitter account, in which the "Colors" singer went in for another smooch as G-Eazy happily obliged. The caption, complete with a heart-eyes emoji, read, "SPOTTED: the hottest couple." According to E! News, the lovebirds continued to express their affection for one another inside the venue. 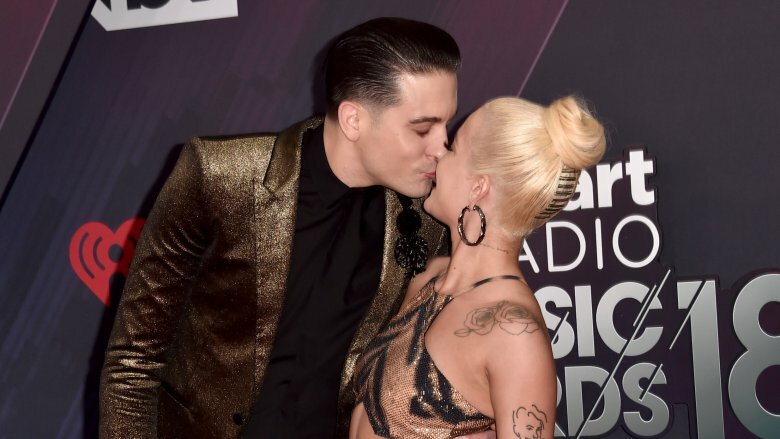 Following his "No Limit" performance with Cardi B, G-Eazy gave Halsey a big kiss when he returned to their table. In response, the "Bad at Love" singer threw her arms around her man to share an intimate moment. The "Him & I" duo reportedly started dating after collaborating together in 2017. "G-Eazy initially begged Lana [Del Rey] to be the singer on his new song 'Him & I' but then they split and he changed his mind," a source told the Mirror in September. "Instead he teamed up with Halsey on the song and he's now started dating her." The "Look What You Made Me Do" singer is all about paying it forward to her fans — and the music video premiere for "Delicate" was no exception. While Swift thanked her Swifties in a pre-recorded video after winning female artist of the year, she also took to social media to engage directly with her adoring followers. "Guys, iHeartRadio Awards are about to start," she shared in a short video on Twitter. "'Delicate' video's about to premiere. I really hope you like it." Soon after, she gave one fan a major surprise by watching and commenting on her Instagram live video. While Swift had been uncharacteristically low-key about the video's release, her longtime collaborator, director Joseph Kahn, teased their latest output earlier in the week. "It's going to be unexpected and it's going to be grand," he told E! News. "I can't get into too much detail. The need is love and the expression of it." Less than a month after the tragic shooting at Marjory Stoneman Douglas High School in Parkland, Fla., which took the lives of 17 people in February 2018, gun control advocacy took center stage at iHeartRadio Music Awards. 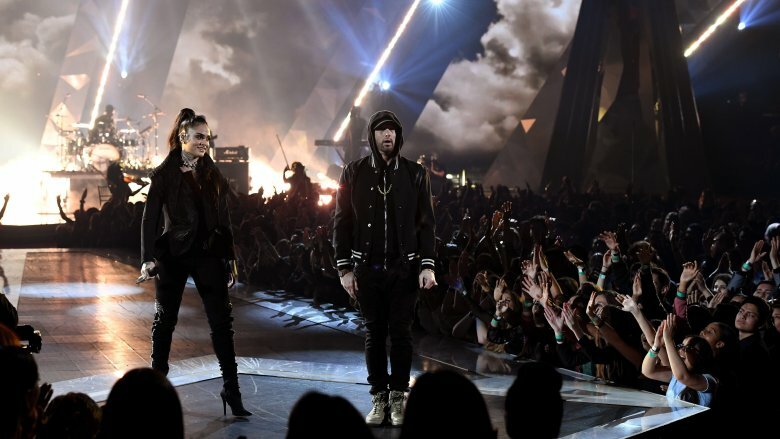 With their politically-charged performance of "Nowhere Fast," Eminem and Kehlani called out the National Rifle Association, while host Haley Baldwin kicked off the show wearing a black t-shirt that read, "Stoneman Douglas High," in honor of the Parkland victims. The discussion about gun violence continued off-camera with subtler displays of support. According to E! News, Halsey, G-Eazy, and Laverne Cox got out of their seats and clapped whenever the topic of gun control was brought up. After Alex Mascou, a student who survived the Parkland shooting, spoke about gun violence while promoting March for Our Lives, Halsey walked over and gave him a big hug. Soon after, G-Eazy joined the two for a photo. Raise your hand if you also aww-ed when Paris Hilton stepped out on stage with her adorable chihuahua, Diamond Baby, to present the award for cutest musician's pet. If you did, then you'll be glad to know she wasn't the only star whose pet tagged along at the awards show. 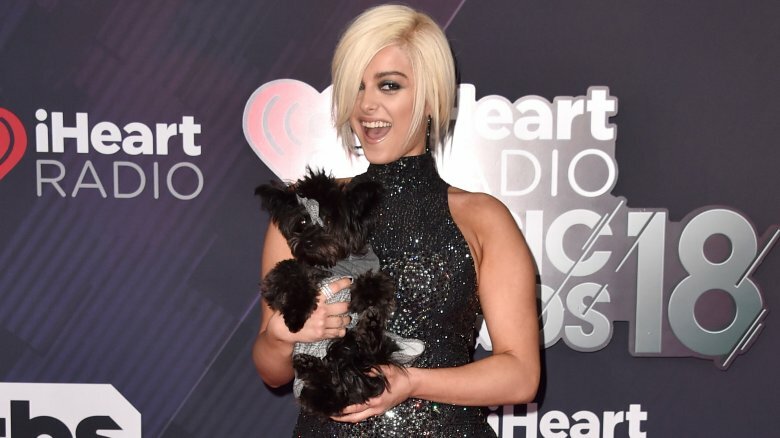 Singer Bebe Rexha, who rocked a sleeveless, form-fitting, sequined dress, posed on the red carpet with her cute pup, Bear Rexha, who also glammed it up by sporting a black-and-white plaid dress with a matching bow. The duo ultimately lost to Ariana Grande and her dog, Toulouse, in the aforementioned awards category, but Bear and Bebe were a hit backstage while hanging out with Riverdale's Madelaine Petsch and singer Travis Mills. Earlier in the day, the "Meant to Be" singer hilariously teased Bear's red carpet debut. "Should I bring Bear Rexha to iHeart Awards today?" she tweeted, adding, "Or maybe she'll bring me since she's the one nominated." 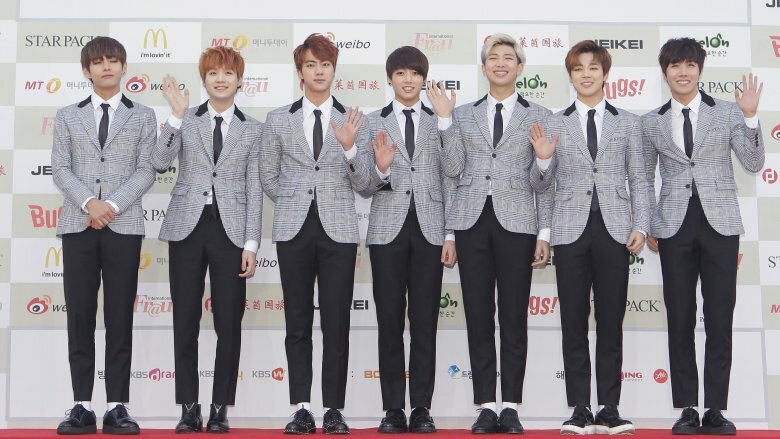 BTS swept the awards show with its two fan-voted wins for best boy band and best fan army, but it was the K-pop group's pre-taped thank you video that gained traction online. "You deserve every bit of this award," bandleader RM told the group's devoted fanbase, while surrounded by his bandmates, most of whom sported large hats. "We're always overwhelmed by your support around the clock and all around the world." While this may have seemed like a standard, yet heartfelt thank you speech, a number of social media users jumped on those hats, claiming that they held a specific meaning. According to ComicBook.com, "In K-pop, hats are often used by idols to obscure their hair color ahead of comebacks to keep fans surprised." As the fan-cultivated conspiracy theory went, the "Mic Drop" singers were supposedly hinting at their highly anticipated comeback. And honestly, their fans were living. "Look at them all wearing caps … I really smell Black-haired Bangtan next comeback" one user wrote, complete with a keyboard smash, while another tweeted, "I'm so alarmed, the all black hair comeback is happening, i'm grateful but unprepared." While most stars, including Sarah Hyland, Hailey Baldwin, and Paris Hilton, were seen happily dancing, singing, and clapping along to their favorite artists as they belted out their biggest hits, some celebs seemed simply unimpressed with the evening's entertainment. According to E! News, Becca Tilley and Ashley Iaconetti of The Bachelor were apparently so bored, they huddled in the back of the VIP section and texted on their phones. Meanwhile, Cardi B followed suit by scrolling through her Instagram feed as Bon Jovi, who won the first-ever Icon Award in honor of the rock group's 35-year career, hit the stage to rock out to his group's most popular and beloved songs. 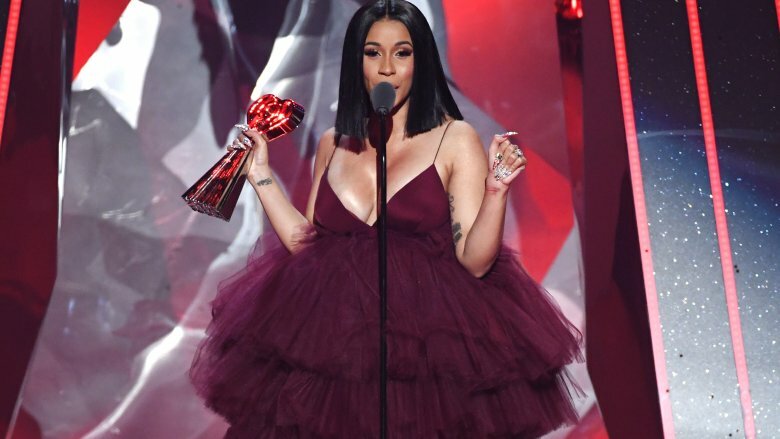 It sounds like the '80's rockers weren't the only people the "Bodak Yellow" rapper, who delivered the best speech of the night after winning best new artist, reportedly dissed. While Cardi B took photos with several people throughout the show, including the adorable Lonnie Chavis and Eris Baker of This Is Us, she apparently ignored co-host Baldwin when she came over to say hello. The television personality reportedly opted to greet someone else at the rapper's table to save face, but seriously, how awkward.